If there is one thing we have learned thus far from the experiment of crypto-currencies, it is that their extreme volatility is stunting the “crypto-economy”. Goods and services are rarely purchased with crypto-currencies because they are too volatile—too risky—for people to depend upon. Sure, they may have shown use in economies like that of Venezuela, where the money drops horrendously even daily. Anything is better than constant erosion of value. 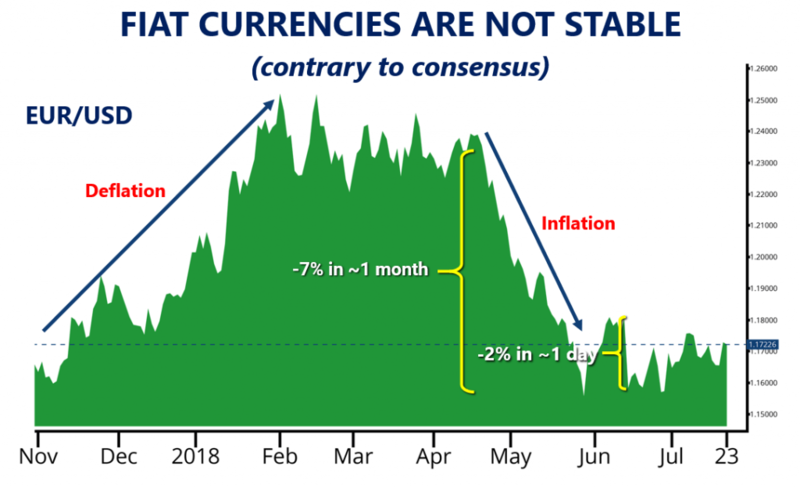 But, as the graph below shows, this volatility exists in fiat currencies as well. In other words, the global economy is suffering from the same problem—we just cannot see it because we are all surrounded by it and don’t know of an alternative. The FreeMark in tests already shows that it is more stable than fiat currencies, and thus provides a more intelligent alternative to fiat currencies, as well as a better way forward than other digital currencies.